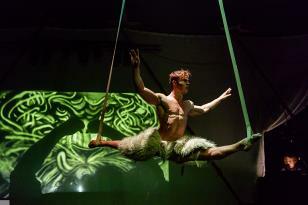 The show is not only fantastic acrobatic ballet, it is a multimedia circus in a setting of huge images. 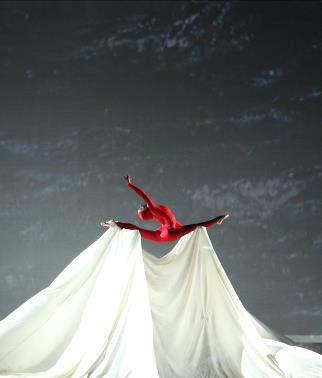 Spectacular acrobatics about the beginning of the world. The acrobats swim like fish, and crawl like lobsters with incredible movements…Many other humorous scenes follow...The whole performance through you get fantastic acrobatics. If you enjoy watching a variety of stunning acrobatic stunts in combination with a cinematic experience EVOLUTION is something you cannot afford to miss. 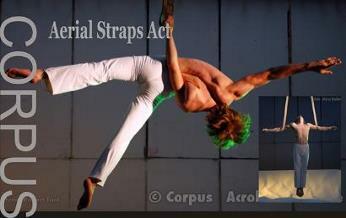 Corpus Acrobatics is an international acrobatic theatre company based in Amsterdam, The Netherlands. 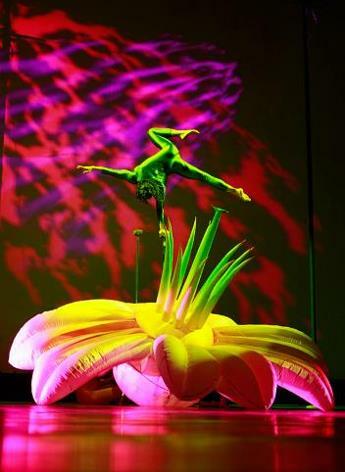 They have been staging spectacular acrobatic shows all over the world for more than twenty years at prestigious festivals and theatres worldwide. 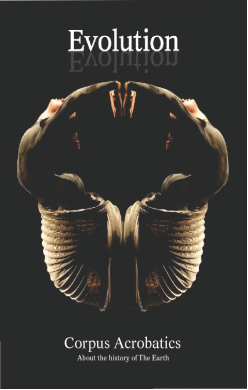 Corpus works with an international team of top acrobats, choreographers and creative directors. Their circus and acrobatic acts stand out because of their great visual impact, expression, sensational acrobatics, choreography, unique elegance and personal style. Productions are suited for large indoor and outdoor venues, but can also run in smaller theatres of just 500 to 800 seats for example. Corpus Acrobatics was founded in 1991 by Vincent Michels and Marley Eltz with the goal of creating a Dutch-Brazilian New Circus style, a combination of acrobatics, dance and theatre. Prior to forming Corpus Acrobatics, they studied at the Como Brothers Circus School and specialized in balance acrobatics with the world champion of mixed pair acro-gymnastics, Emil Krastev and Euvgenie Kolef, the coach for the national team of the Bulgarian Acrobatics Federation, famous for East-European skill and technique in acrobatics. They had further training from Jonathan Wolken, of the Pilobolus Dance Theatre in the U.S. and with Itziki Galili in the Netherlands. Since then the company has grown and flourished with international performances and productions of works such as “The Five Magic Olympic Rings” for the 2012 Olympic Games Celebration of the Dutch athletes, a special circus show for AQUANURA (the largest water show of Europe) and the Cervantino International Festival in Mexico. 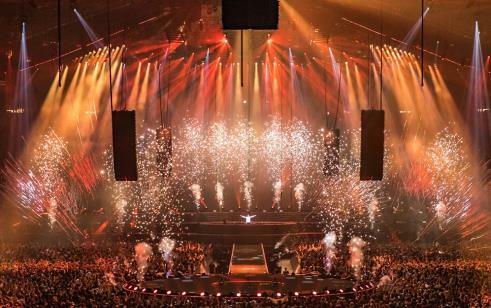 They have also presented works with major symphony orchestras in Europe such as the Royal Concertgebouw Orchestra, The Hague Philharmonic in cooperation with AVRO TV, and created the opening choreography for the official ceremony of the Euro in 2001. In one of their shows, Evolution, an international troupe of top acrobats from The Netherlands' Russia' Albania' France and Brazil are guiding the audience into galaxies, different planets, oceans, and caves - all in a high-tech setting of video projections by photographer Frans Lanting, one of the best wildlife photographers of our time well known for his work with National Geographic. Evolution is a journey through the history of the Earth, the mystery of the universe, and the impact of humanity on this fragile and complex system. Choreographers Vincent Michels and Marley Eltz combine high skilled acrobatics with visual theater, dance, and video projections. An impressive and unique experience, Evolution has been described as a multimedia circus about the history of the Earth. Some 4.6 billion years ago, a spinning cloud of cosmic dust and gas contracted to form a young star and its retinue of planets. The Evolution show is all about the solar system that emerged and the planet Earth. Come on board in this time machine and experience the powers of nature from the beginning of the times to the present in a spectacular acrobatics show. The United Nations declared 2010 to be the International Year of Biodiversity. It is a celebration of life on earth and Corpus Acrobatics was proud to be part of it. In different scenes the spectator is taken through various phases of evolution on our planet and many references are made to the powers of nature and wildlife itself. Eventually the show's finale undoubtedly refers to the importance of guidance and the truthful use of our planet and all that lives and belongs to it. This production includes a very young acrobat whose interaction with the group of young powerful male and female acrobats resembles panthers and snakes. Young kids in the audience identify with the little girl and are transported into the world of theatre, dance, the circus and world-class gymnastics. Those are the moments for young kids in the audience to get a bit closer to the worlds of theatre, dance, circus and top class gymnastics by identifying with the little girl. Even so, this is a “show” that thrills and entertains audiences of all ages. Corpus Acrobatics has a unique repertoire of works for you to choose from. They are also adept at developing acrobatic choreographies around specific concepts and special occasions. 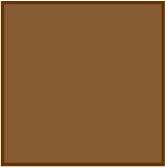 In 1999 the Dutch television asked Corpus to develop one on Ravel's Bolero, which was conducted by Jaap van Zweden. In 2000 Corpus made a special choreography for the opening of the Millennium concert given in the famous Concertgebouw of Amsterdam, where they also presented the Carnival of the Animals with orchestra. The resulting works are each a different and unique “dream.” These have been created for presenters as well as product presentations, commercials, business celebrations, and conferences covering a broad range of topics, even scientific and medical ones. Presenting a combination of sensational movements, elegance and illusions has become their calling card, a card already known by many different companies and presenters. offering a quality experience composed of beauty, balance and perfection. Seldom a ballet will move your imagination like this one...The artists perform daredevil acrobatics. Of course, you can see this also in the circus, but never in such a fantastic choreographic setting. An outstanding performance for young and old alike. Please Click on Image Below for a PDF of Evolution!